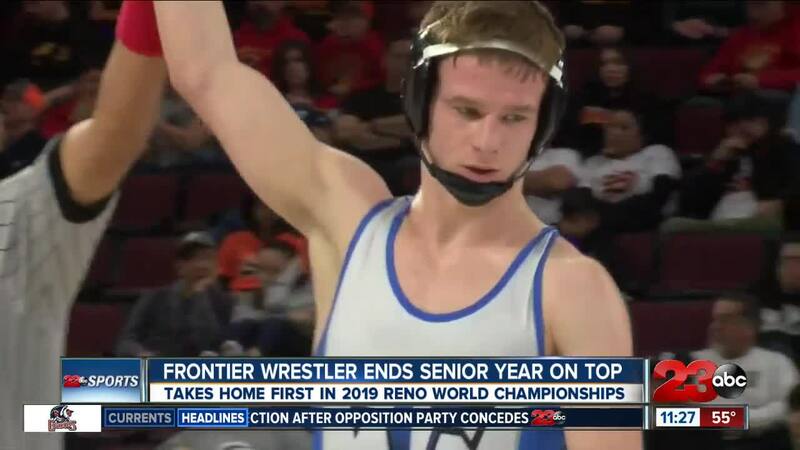 BAKERSFIELD, Calif. — Competing with thousands of wrestlers spread across 40 states, Bakersfield native Ryan Morphis took home first place in the 2019 World Championships this past weekend in Reno, Nevada. With a take down in overtime, Morphis topped off a successful senior year. In the CIF State Boy's Wrestling Championships, Morphis also pulled off a huge accomplishment. After losing to an unseeded wrestler in the opening rounds, Morphis won eight straight matches to claim third place in the State. “[The] first match kind of [caught] me off guard," said Morphis. "I had to mentally check myself after that match to keep me going. "You have to be able to lose and learn from it and win and still learn from it. [Growing up in wrestling] it was just drilled into my head, to just keep going forward and keep learning." He now teaches those lessons to young wrestlers in his club team Elite Force. “He's the kind of kid that’s going to elevate the program with his character and hold people to a higher standard because him himself lives at a high standard," said coach of Elite Force, Carlo Franciotti. Morphis will now continue his wrestling career at the Colorado School of the Mines as well as study mechanical engineering. “It's kind of a dream come true being able to wrestle there and get a really good degree," said Morphis. "It's all I want in life."